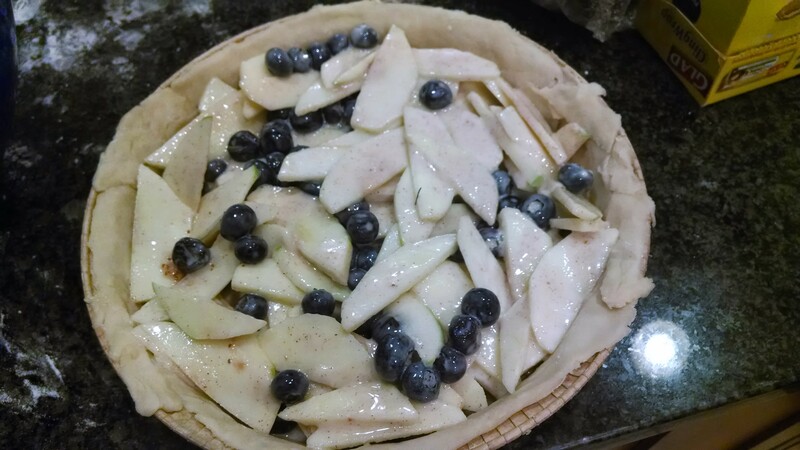 This is an old pie I made for a party I went to on the 4th of July. I always liked the look of those whipped cream-strawberry-blueberry 4th of July cakes, so I had blueberries in the hope of making one. 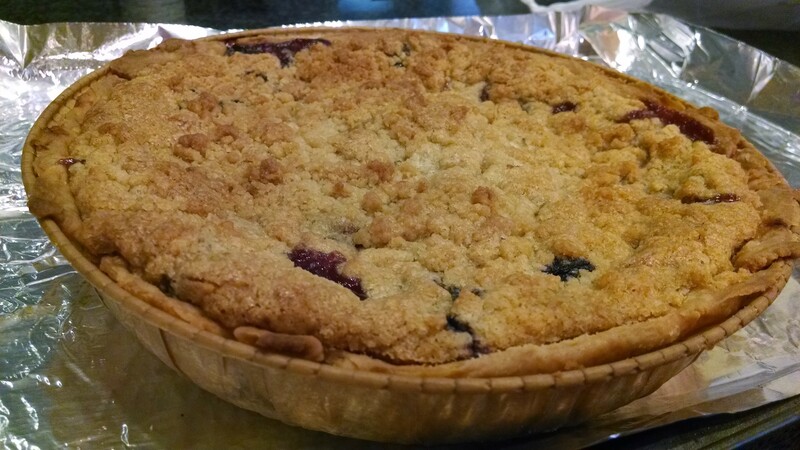 But I didn’t get strawberries, and our friendly visiting postdoc made an AMAZING pie crust and had left the extra dough in our fridge. So I went with apple pie for the America! theme. This was in a sublet apartment- i was just borrowing the Pad. It was a good place to store Apples. 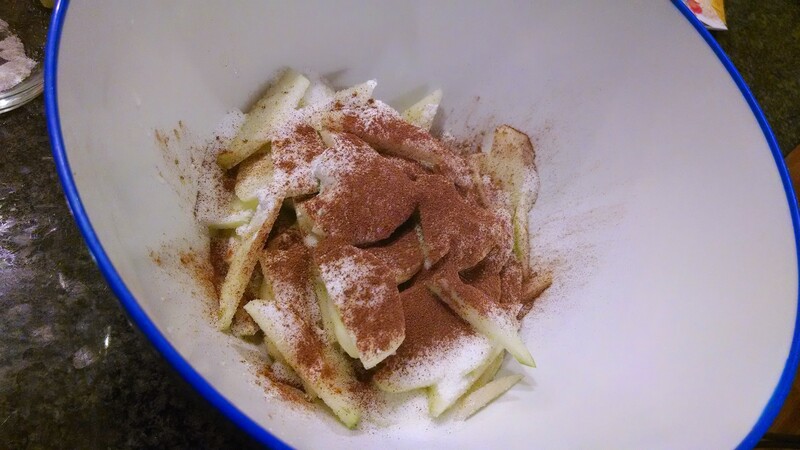 So I did the usual peel and slice the apples, top with sugar and cinnamon, put into a pie crust. But ALAS! Three apples wasn’t enough to fill the pie! After seeing my pie crust sadly filled about halfway, I raided our fridge. 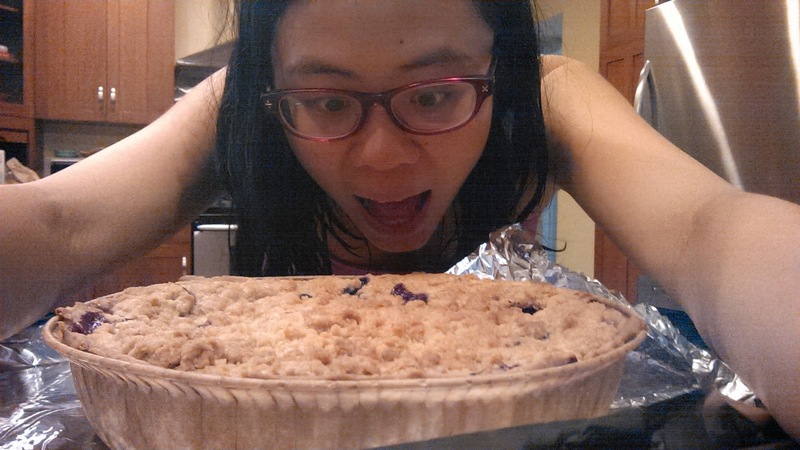 I found a package of blueberries and a container of yogurt, so thanks to google I rescued the pie! Basically it’s a normal apple pie, plus yogurt and blueberries. The creaminess of the yogurt really makes this pie special and different. I wish this recipe had been written by a guy named Barry. So there’d be no more need to feel blue, Barry to the rescue! For fruit pies I always prefer a streusel topping. Actually, for anything I prefer a streusel topping. If streusel is at all appropriate I say go for it (so toss it on top of any cake or bread/muffin possible, but maybe avoid the pavlova). I like it so much I rarely use a recipe for it anymore: just mix flour and brown sugar (equal parts), and then cut in slightly soft but chilled butter until you have crumbs. I use a fork and knife like the butter is a very soft steak. If you’re running low on butter you may find yourself in a streu-seller’s market. I had to investopedia “seller’s market” to write this pun. 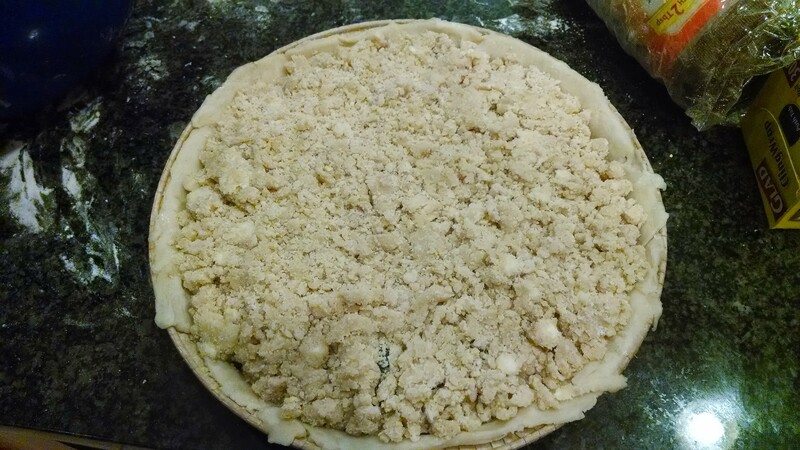 Then sprinkle the streusel over the pie and spread it out so the whole top is covered. You want some of this deliciousness in every bite. Bake, let cool, and eat! Preheat oven to 350. 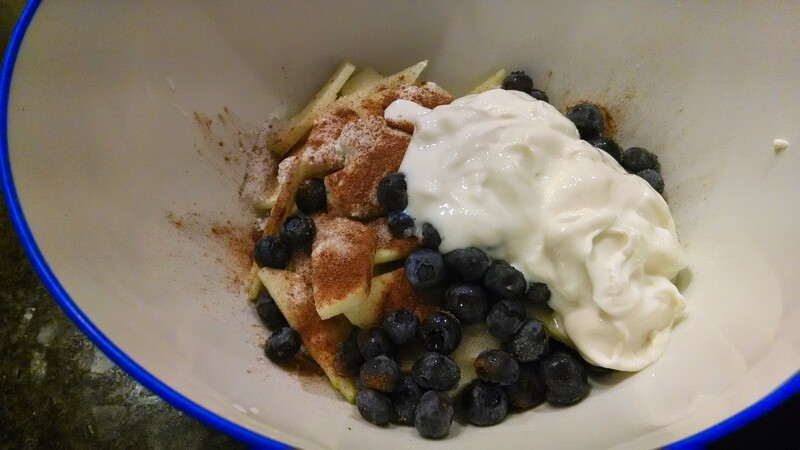 Slice and peel apples, toss with blueberries, yogurt, sugar, and cinnamon. Put into pie crust. 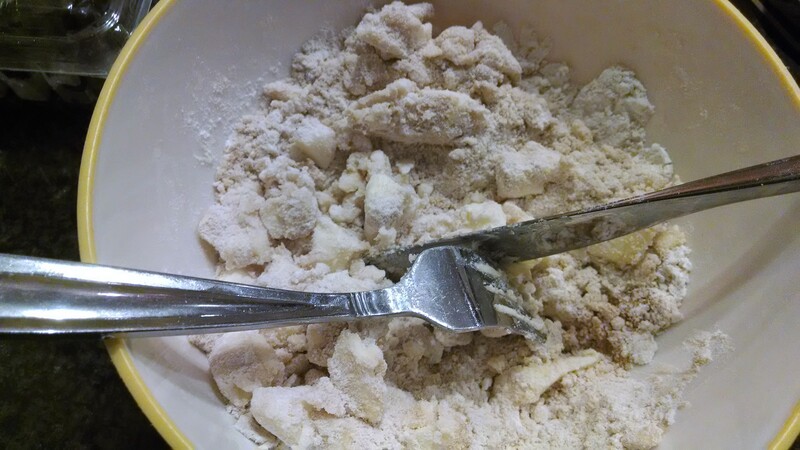 Using two knives or a pastry blender or a fork and knife, cut the butter into the flour and brown sugar until coarse crumbs appear. Top pie. 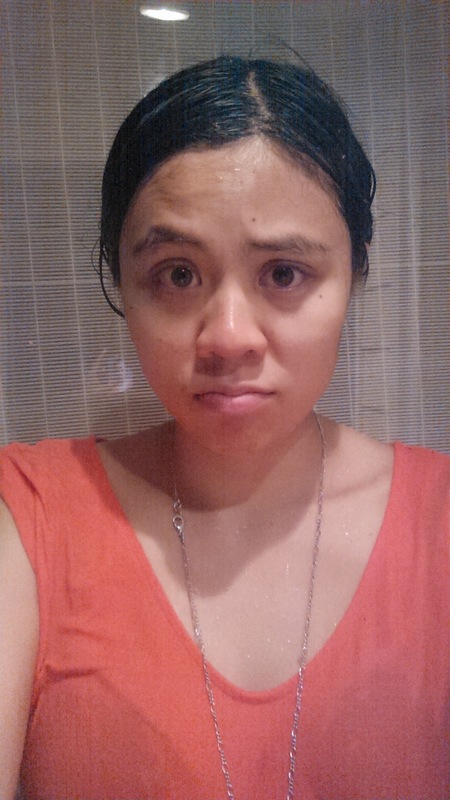 Bake for 45 minutes or until bubbly and golden brown. Can you make pretzel salad and let me know how it is? Will do! I didn’t take pics so won’t blog about the amazing chocolate trifle I made the other day: over dry chocolate cake (cake mix + can of pumpkin + 2 eggs) with cream cheese frosting (cc + butter + p sugar), so I cut it into squares, drizzled with Bailey’s, layered twice with raspberries, fresh whipped cream, and jello pudding (unnecessary). It just got tastier and tastier as it sat in fridge and was so pretty!